Mosquitoes tend to come out in your yard during the best time of day: The evening is when the mosquito fun starts in the garden. But how to enjoy spending time outdoors without being bitten by a mosquito? Are there any home remedies or naturally helpful repellents? Evenings outside should be fun, but any enjoyment you may receive from time spent outdoors vanishes when you have pesky mosquitoes flying about and trying to bite you. Let’s fix that with these ways to get rid of them! You can always use chemical repellents to keep them away, but surely there must be more natural solutions to keep your yard mosquito-free and ready to be enjoyed? There are, in fact, many natural ways that you can keep mosquitoes out of your yard without needing to resort to harsh chemicals. Continue reading to learn how you can naturally repel mosquitoes from your yard and once again be able to enjoy your time outdoors without being bitten every few minutes by bothersome insects. There are plenty of chemical-laden products available on shelves that swear they will eliminate mosquitoes from your yard. 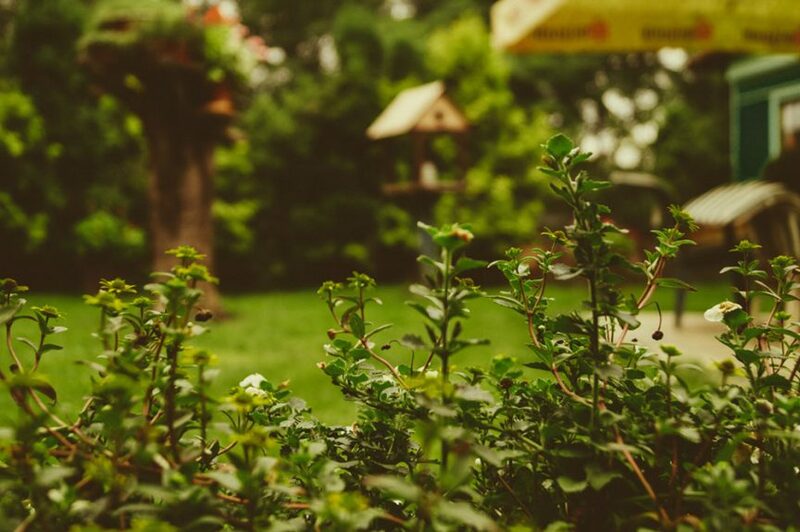 But if you have children or pets (or just don’t want a yard filled with potentially dangerous chemicals), there are tons of natural ways to repel mosquitoes from your yard. Keeping mosquitoes out of your yard naturally starts from the ground-up. Mosquitoes use standing water as their breeding grounds and rely on plant growth to provide cool areas so that they can rest. If your yard has either of these things, mosquitoes will be tempted to visit and will likely prey upon you and your loved ones in the meantime. You’ll need to remove any mosquito attractions (like standing water or tall grass) before you can really assess the situation. Once you’ve gotten rid of any potential mosquito attractions, you can really begin looking into ways to naturally repel mosquitoes from your yard. Planting mosquito-repellent plants or using certain types of lighting or torches can naturally keep mosquitoes at bay. There are also certain landscaping tricks you can do to lessen mosquitoes, like making sure your planters and yard have proper drainage or using landscaping to your advantage. All of these methods are all-natural and work without needing to rely on chemicals, so you don’t have to worry about using anything that will potentially harm your yard or any of your loved ones. To get you started, we’ve gathered 15 natural ways to keep mosquitoes out of your yard that don’t involve reaching for any chemical repellents; in fact, all of the methods detailed below are safe yet effective. 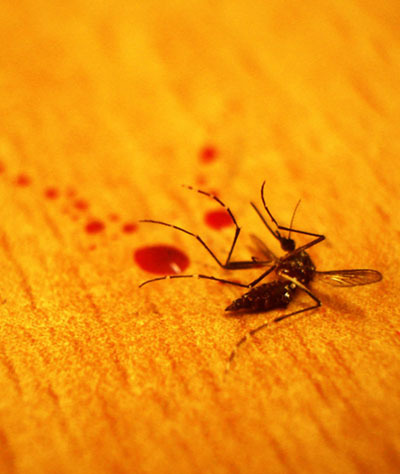 Don’t continue to suffer from mosquito bites whenever you step outdoors or feel like you have to stop using your yard to avoid these pesky insects. Just follow our advice and you’ll be naturally repelling mosquitoes from your yard in no time! As you begin looking for chemical-free ways to keep mosquitoes out of your yard, first look at cutting them off from the source. Mosquitoes breed in stagnant water and many of us are guilty of keeping standing water in our yards. Things like bird baths, watering cans, and gutters are often big culprits that may not seem as obvious; pet bowls and unused pools or ponds should also be considered. Remove anywhere that water could collect and serve as a mosquito breeding ground. If you want to keep bird baths or other containers, remember to change the water weekly to eliminate any mosquito larvae that may be hiding inside. Adding a current to pools or ponds will also reduce the possibility of mosquitoes using the water to reproduce. If you’re a gardener and you are having trouble keeping mosquitoes out of your yard, it’s time to take a look at any potted plants you may have. Most gardeners already know this, but potted plants have a tendency to fill up with excess water. This excess water can not only harm your plants, but it can also attract mosquitoes as it provides an adequate breeding ground for them. Many potted plants don’t have very good drainage and it can be difficult to create an adequate drain without damaging the pottery. Instead, consider moving your potted plants indoors during weather or muggy months to remove any temptation for breeding mosquitoes. You can always move them back outside once the weather cools down and mosquitoes start to die off. Alternatively, you could look at replanting any potted plants in planter boxes with proper drainage (so long as the plants won’t overtake any others in their box!). If you have already read our recommendations for 21 mosquito repellent plants, you already know that there are certain plants you can grow that will keep mosquitoes away without the harsh use of chemicals. Lavender, marigold, and lemongrass are a few of the more popular and beautiful options, but there are so many more that will also really spruce up your yard while also keeping the area free of flying pests. Many of these plants are both visually appealing and effective at keeping mosquitoes away. There are also certain herbs you can grow that are great for keeping your kitchen stocked while also repelling mosquitoes, like basil, thyme, and rosemary. Take a look at the article listed above for mosquito repellent plants and also this list for even more plants you can grow to keep mosquitoes away. Do you enjoy a steaming cup of coffee in the mornings? You may be surprised to learn that not only is coffee great for giving you an extra kick of caffeine, it can also help you control the mosquito population in your yard. Coffee grounds sprinkled where there may be standing water you can’t remove (like around garden plants) will kill any mosquito eggs there may be. This is because the grounds force the eggs to rise to the surface, where they are deprived of oxygen and die off. If you’re looking to use this method, older coffee grounds work best: Try to age them at least 25 days before sprinkling 3 tablespoons of grounds for every cup of water. As a bonus, these coffee grounds can be beneficial to any plants they are scattered nearby providing extra nutrients to help the plants thrive. If you have a green thumb, chances are you have a few planter boxes around your yard to grow plants. If these planter boxes do not have an adequate drainage system, they can lead to an excess of standing water that will attract mosquitoes. Remedying this situation is fairly easy: Just add a drain to your planter boxes! This can easily be done by drilling holes in the bottom of the boxes to let out excess water. If you want to ensure your planter boxes have proper drainage, consider scrapping the old ones and building new ones with hidden drainage. If you spend a lot of time in your yard during the evenings, you may be tired of being bitten by hungry mosquitoes that come out at full-force after dark. There are insect-repelling lights available on the market that seek to remedy this issue and provide some much-appreciated light for your yard. Sodium lamps, yellow bug lights, and LED lights all deter mosquitoes from flying close and they are easy to find at your local home goods store. These yellow LED bulbs from Amazon are perfect for keeping mosquitoes away. You can also purchase all-in-one outdoor lighting and mosquito repellent fixtures for even more effect. Now you don’t have to worry about stumbling around in a dark yard while being bitten by mosquitoes any longer! A yard with good drainage is pivotal to keeping repelling mosquitoes. If you’ve already removed physical sources of standing water (like watering cans and potted plants) and still find yourself with puddles in the yard, it’s time to look at installing a french drain. French drains use perforated pipes that let water enter and exit through small openings that can be used to direct water flow away from your yard. HGTV has a great tutorial on how to install them. Take note that it will require a lot of manual labor, so inlist a few savvy friends to help or be willing to pay a professional to install the french drain. It may be a significant investment, but your new french drain will more than pay for itself by keeping your yard adequately drained and reducing mosquitoes. Do you enjoy gathering outside with your family and friends around a bonfire or firepit? If so, you may already know the wrath of hungry mosquitoes that seem to swarm around the fire. If you’re looking to repel them without chemicals, try burning pinion wood next time you have a gathering around the fire. Pinion wood has a smoky pine fragrance that adds a great aroma to the air and also helps repel mosquitoes. You can purchase pinion wood from home goods stores or order it online (here are some pinion mini-logs perfect for your next fire pit). Just make sure that it is authentic pinion wood and not merely mislabelled. Many stores will label regular pine wood as pinion, so ask an expert before purchasing or look up the brand online to ensure your money is being well-spent. A fairly easy and cheap way to keep mosquitoes out of your yard is to simply use a fan or two. Electric fans create a steady breeze that makes it difficult for mosquitoes to fly against, thus reducing their chances of flying into your yard. The breeze from the fans also helps dissipate carbon dioxide quicker, a compound that we breathe out which attracts mosquitoes. Oscillating fans are extremely effective at keeping mosquitoes at bay, but any fan will do as long as you are sitting or standing close enough to benefit from its breeze. Just set one up beside you next time you are out on the porch and enjoy the soothing breeze and sudden lack of mosquitoes. Proper landscaping can do so much more than merely create a beautiful yard. For instance, did you know that red cedar mulch actually repels many pest insects including mosquitoes? The smell of cedar oil remains trapped in the wood within the mulch and its aroma helps repel mosquitoes (as well as termites, ants, moths, and many more.) Apply red cedar mulch around your gardening and in flower beds to take advantage of its natural mosquito repellent properties. When you notice its cedar aroma beginning to fade, merely swap out your old mulch for fresh mulch to continue keeping pests away. If you have ever picked up a bottle of bug spray before heading outside, you may already know about the effectivity of citronella. Citronella oil is a common ingredient in most commercial bug sprays. The citrus-like aroma of citronella works wonders at repelling mosquitoes and other flying pests. If you’re looking to use citronella to protect your yard, consider investing in citronella candles or torches. By burning the citronella oil, you’ll create an effective area of mosquito repellent. As a bonus, citronella torches often come in decorative holders that can really brighten up your yard when they are placed strategically. In addition to creating a yard filled with mosquito repellents, you may also consider attracting some of the mosquitoes natural predators to hunt down any outliers that may be flying about. Both birds and bats love to munch on mosquitoes and can easily be attracted to your yard. Birds will protect your yard during the day, while bats can take the night shift. It’s also fun to watch them flying about! Consider installing birdhouses, bat homes, and putting up feeders to attract these natural enemies of the mosquito to your yard. You’ll be bringing good nature into your area while effectively reducing the mosquito population. During warm weather, mosquitoes like to cool off in tall grass or brush. If you go long periods of time without mowing your lawn or you allow weeds to pop up in thick patches, you are creating the perfect hiding places for mosquitoes to rest when they are seeking out somewhere safe to cool off. You can fix this by remember to mow your lawn regularly, using a weed wacker to keep unwanted plants at bay, and trimming any bushes or trees that may be growing unruly. Keeping your yard neatly trimmed will also allow the sun to dry up any wet spots or puddles that may arise. If you are a fan of DIY projects, consider making your own sugar mix mosquito trap. You’ll need 1/2 cup of brown sugar, 1/2 cup of boiling water, 1 tablespoon of dry yeast, and 1 plastic soda bottle. Cut the bottle in half and combine the water and sugar until the sugar is dissolved, then pour the cooled mixture into the bottle. Sprinkle yeast over the top and then invert the cut-off top of the bottle and secure it to the trap. The trap will attract mosquitoes who will become stuck inside and die. This diagram explains how to create the sugar mix trap in greater detail. If you have already tried less severe methods and found you’re still getting bitten by mosquitoes in your yard, perhaps it’s time to consider a bug zapper. You can purchase one to hang on your porch or install wherever you spend most of your time in your yard. Bug zappers work by emitting UV light, which attracts mosquitoes. When the mosquito lands on the bug zapper, it ‘zaps’ and kills them. Recent bug zappers also emit carbon dioxide for a double-whammy at attracting and destroying mosquitoes. If you don’t mind cleaning your bug zapper every now and then or the light and noise it emits while killing mosquitoes, consider trying one in your yard to live mosquito-free. If all other natural methods fail or you still need additional protection from mosquitoes in your yard, consider a natural yard treatment. There are products available that use all-natural ingredients to repel mosquitoes after you use them to treat your yard. You can get these in a variety of forms, but the most common may be a spray treatment. This yard spray from Wondercide uses natural ingredients to repel pesky insects like mosquitoes without putting you at risk from harmful chemicals. Eco-Guard also offers a concentrate which can be sprayed on your lawn to repel mosquitoes, also without the use of chemicals. Don’t feel like you have to sacrifice enjoying your yard if it means avoiding mosquitoes. As we have demonstrated above, there are many natural ways to repel mosquitoes from your yard without resorting to potentially harmful chemicals. The most important part of keeping mosquitoes from your yard is merely making sure to maintain your yard: Eliminating standing water, keeping things neatly trimmed, and attracting natural predators of the mosquito is a good way to start. You should also take a look at our list of recommended products for repelling mosquitoes for more ways that you can fight off mosquitoes and get back to enjoying your time in the great outdoors. Don’t let pesky mosquitoes keep you from loving your yard and enjoying time outside with your loved ones!